Nice down pillow. Nice full fill and is holding up to use. 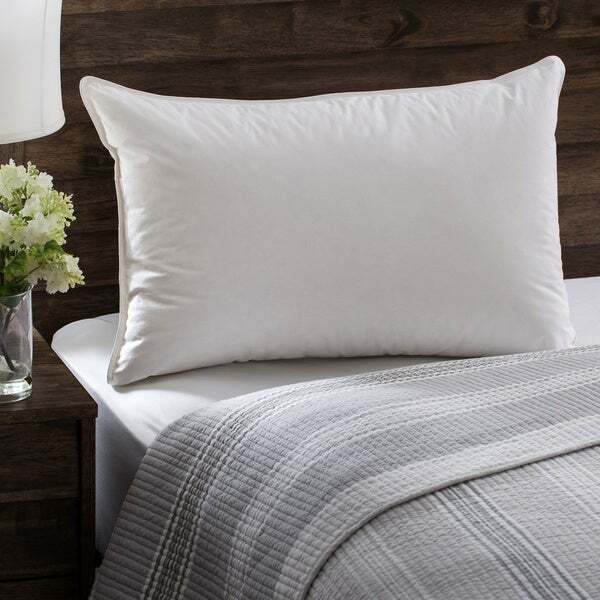 The European Heritage Down Allure Soft White Down Pillow is perfect for stomach sleepers. This pillow is made from cambric cotton that will provide a crisp finish. The white down filling will give you an unrivaled soft feel. Corded edge construction ensure the longevity of this particularly comfortable item. The all-natural materials are environmentally friendly, reducing your household waste stream while improving your bedtime comfort. Down- and feather-filled products are packaged tightly during shipping. Upon receipt, remove this item from its packaging, fluff gently, and allow several hours for full loft recovery. In addition, products sealed in plastic packaging sometimes have a disagreeable scent because of concentrated natural fibers. A few hours of airing typically removes the odor. Very satisfied with this purchase. I tried to find something cheaper - actually bought and returned about 6 pillows from Overstock and wasted a lot of money on return fees - but the cheaper options were not satisfactory for a variety of reasons. I am a side sleeper and need a pillow that is fluffy but goes fairly flat -- does not hold my head up at an unnatural angle. I have been sleeping on this pillow for a couple of weeks now and it's great. There was another one that was good too but it was even more expensive. This pillow is very fluffy but goes down to just the right height. I'm surprised by such lofty reviews for this pillow. I order two king sized and noticed right away the down fill was minimal at best. I toss and turn at night, sleeping in all positions... and this pillow didn't have sufficient fill for any of them. The cover seemed of okay quality, but nothing to write home about. Tag stated 75% down fill, although it didn't give a poundage of down. Sleeping on my back felt like the back of my head was pretty much on the mattress, side had no neck support, and stomach was breathing into my mattress. This is really an outstanding value for a down pillow. Even though it's rated "soft," there is plenty of fill--really somewhere in between a soft and a medium fill. Perfect. I got it for my son, who's a back and stomach sleeper, and he likes it so much that I just ordered another one for him to take back to college with him. SOFT WITH GOOD LOFT. VERY COMFORTABLE FOR A BACK SLEEPER. I have bought probably 20 down pillows between my two homes; this is without a doubt one of the best. It is comfortable...not too soft, and maintains its shape. These pillows are not as soft as I would like but I did keep them and am using them. I am hoping that in time they will soften up but note I like pillows to be REALLY soft. I purchased a bunch of these for our bedrooms and couldn't be happier. They are nicely stuffed - not too much or too little. I usually like more support but find that some firm pillows are uncomfortable because they are too stuffed so doubling up on the medium/soft pillows is the best solution! Very well made and absolutely no odor. My favorite pillow was from ahotel. It was heavier than this. Two things i disliked from this pillow are: 1. Not enuough filling. I want my head to end up half way down the pillow not at the bottom. 2. The shell of the pillow was not soft enough. It was too crisp. The inside material was exactly what I wanted but since the other two problems, I am returning it. This upsets me becasue to return it, it cost me $* ! which is crazy for a standard lightweight pillow. These pillows truly feel like what sleeping on a cloud must be. Perfect. The sizing exactly fits our king-size pillow sheets for our king-size bed, and the standard size fit our standard pillow sheets perfectly. I never bought a pillow on line before but am so glad I did. I'm very pleased. It could not be better. I have spent $300 on down pillows these are every bit as nice for fraction of the price. The pillow was very plush and made well. It honestly sank a little too much for my liking but my wife loved it. I got the king sized and I think I would have liked better if I got standard size instead. I have replaced all the pillows on my beds with the down pillows. Everyone swears they are like sleeping on a cloud and have replaced their pillows as well. I love the softness of this pillow and there are no feather poking out at you. It was a good price and worth every penny. You will not be disappointed! Endless searching for the right pillow. this is nice. not sure I would buy another. its not dense. Its not firm. seems to not hold shape. very light weight. my husband uses this pillow and is happy enough with it. too soft for me. He is very fussy so I would say it good. but not sure I would buy again. not really worth the price. seems like it should be more substantial. I had to send it back because it had to much down packed in it. It just didn’t have any give in it, which made it impossible the last down pillow I bought from them. The price was MUCH too high priced and not nearly as comfortable. They should have kept the ones like I bought from them a few years back. Would like to see the other ones back!!!! This pillow is better than any soft pillows I’ve ever used. Supportive but pliable. I love these pillows they are so comfortable, I am considering buying 2 more. I take them everywhere I go. Comfortable and hold their shape well. Great pillow! Down lovers with appreciate it ! Just like a light cloud. Soft. "how many pillow does it come with"
"Is this pillow 100% down or are there feathers in it as well?" label on pillow states contents as "White Down (minimum 75% down)" No other content is mentioned. "What is the return policy on this pillow? I have a pinched nerve in my neck & need a soft pillow that keeps me aligned, not too high or low!!! Recommendations please???" "Is the price for 1 pillow or 1 set of 2?" This item features one pillow per order. Very fond of down pillows, andd this one is washable.